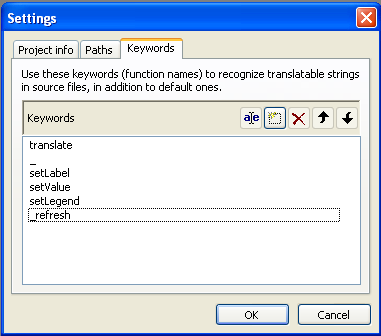 Is there a way to specify regex to match ‘label’ => ‘?’ in poedit or sth like that? Do you have any suggestions how to translate therse? yes its great, ‘value’ => _(‘Submit’), used in form factory and it was scanned by parser in poedit. 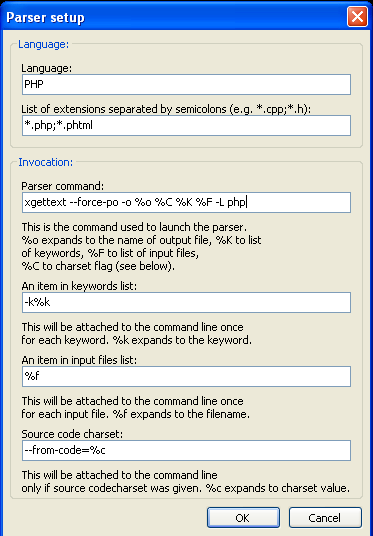 Can convert common PHP files used for localisation into PO files. 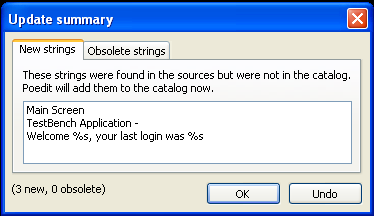 so they always go to obsolete strings?! A bit late answer I guess, but to get Poedit to see plurals you need a new helper function that takes three arguments rather than an array. As the first one, from what I remember, works for the actual translation (but just doesn’t get picked up by Poedit) you just need a dummy function to pass through the arguments and then call the actual translate() function with an array. Couldn’t get Poedit 1.4.6 to work properly on win7 32bit with your instructions. It just wouldn’t scan my application folder. So I opened xgettext.exe in cmd with -h command, and found that -L php is incorrect as it should be PHP (capitals). Now it scans my folder correctly. Don’t know exactly about other versions, but this might help someone and save them some precious hours! 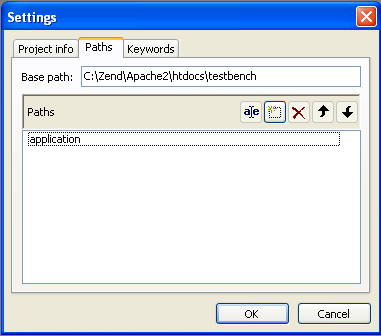 I couldn’t get Poedit 1.4.6 working on Windows 7 until I duplicated the base path into the path list. See http://stackoverflow.com/questions/3709146/using-poedit-with-xampp. Remember to also include application within the path list! I am looking forward to read all your articles on about the Zend Framework. If no strings can be found, can I enter them manually? I used a comma as a separator. You can stare at it for hours and still not see it! You saved my day Stamrecht BV. I set it up a year ago and it took me a long time then to figure this one out. And today again it took me a few hours. I can’t believe it. I am stupid apperently. Even the CAPTCHA for submitting this comment takes me a while. Sie können PO-Dateien auch mit poeditor.com lokalisieren. Saved my day. Works fine with #ZF2 too – of course! This saved me lot of time. Before I read this article it took me a long time then to figure this one out.